DEER VALLEY 5 BR/4BA - Ideal 2 Family Condo! Only 1 1/2 min. to lift! ALL NEW FULL REMODEL for 2016 !! GORGEOUS !! 1 minute to Deer Valley's main lift (Snow Park)! 1 minute to Main St ! PERFECT FOR TWO FAMILIES, sleeps 14 in beds! Up to four couples can have their own private & quiet bedrooms while the kids can enjoy making tons of noise in the remodeled bunk room! The FREE SHUTTLE stops at your FRONT DOOR every ten minutes (really!). It takes 90 seconds (800 yards) to arrive at Deer Valley's main lift (Snow Park)! Only 1/2 mile to Main Street. Easier & faster than what many call ski in/ski out! This 5 bedroom unit has sold out EVERY SINGLE NIGHT of EVERY SKI SEASON for 14 years running! Once rented, everyone wants to return. Inquire now, sells QUICKLY. Why so popular? Perfect location, great price, great furnishings/amenities, full wifi, tons of kid's stuff, lay out designed for families! Please read the testimonials from other renters! Rent directly from owner and save 25% or more over what everyone else is paying for this awesome unit! (those renting through a commercial property mgt. company). 42' Flatscreen in all bedrooms, billiards/party area and great room. We want to keep this place the nicest rental property on the market! Full remodel for 2016 season! Guest pays check-out cleaning fee. Return discounts available. Holiday rates may be higher. Take 5% off of the rental amount by paying with a personal check. EVERYTHING is kept new or nearly new. Six TV/DVD's, Stanmore Marshall Sound Box for your phone!, Work space w/ PC computer/laser printer/fax/scanner/copier/Wi-Fi through out, Nintendo, board games, DVDs, music library, private hot tub (7 person), slate pool table, etc.! This is 3200 sq. ft. of 100% authentic ski home located on Deer Valley Drive. Kids AND parents LOVE this place! Don't stay in a cold senior's golf condo miles out! Ideal for two families! Five bedrooms: three king, one queen, and a bunk room with three sets of bunk beds. Plus large overstuffed sofas, roll out bed available and two king-size Aerobeds if needed, collapsable Graco crib, four full baths, sleeps 14 in beds with lots of extra capacity, full kitchen/dining room, 3200 square feet. Reserved parking at front door for two vehicles plus overflow parking. Located on Deer Valley Drive in Lower Deer Valley (Snow Park - see link to map) your condo is just 800 yards to the Deer Valley lift, 1/2 mile to town, 1-1/2 miles to the Park City lift, 5 miles to The Canyons, short drive to Solitude, Brighton, Alta and Snowbird. 35 minutes to Airport. The upper level has two master bedrooms w/ vaulted ceilings / private master baths and TV/DVD's. One bedroom is especially large with a Sony Vaio pc with work station, printer/fax/WiFi, etc. The middle level has one master bedroom with vaulted ceiling, master shared bath & TV/DVD. Also on this floor are the kitchen, dining and great rooms. The two story glass great room was recently remodeled and expanded. New flat screen over the fireplace, a 525 watt surround sound/stereo, lots of movie DVD's and a music CD library. Large sofas for movie viewing. Great for two families! The stone fireplace burns real wood. Private outdoor hot tub. The lower level has two additional bedrooms geared towards kids. One room has a queen bed with no bath. The other is the fun bunk room that sleeps six. (3 sets of twin over full bunk beds) Being recently added, these cozy bedrooms have no exterior windows but have really cool lighting and effects. Both bedrooms recently remodeled. Bedrooms share a travertine/slate full bath. On this floor, the bedrooms have their own 42' FLATSCREEN TVs w/ DVD & lots of video games. Many DVDs, plus kid's movies to watch. Also on this floor is the 'party area' with a beautiful knotty pine slate professional pool table, granite wet bar, new 42' flatscreen, executive refrigerator/dishwasher/microwave, and a mini-stereo. CENTRAL HUMIDIFIER to keep you comfortable and your winter 'high altitude dryness' in check. Try to find that in other units! Small portable humidifiers in bedrooms in case you are extra sensitive. Humidified air makes your vacation more comfortable, that is a fact! PRESTOCKED KITCHEN/BAR per your desire (minimal charge). We will send our 'locals only secrets' about shopping, restaurants, adventure activities, ski areas, parking and the US Olympic Park. Because this terrific unit is in such excellent condition we request families and married couples only. (Sorry college students!) No party throwing, no pets and no smoking please. Have a blast in terrific home located among the BEST SKI AREAS in the world but please respect this family owned unit. Maximum occupancy 14 without specific permission granted at additional cost. Minimum age of primary renter(s) should be 30 without granted request. Thank you! Utah arguably has the best skiing in the world. Little Cottonwood Canyon often gets over 700 inches of powder annually (more than double Colorado). When I was younger I skiied almost everywhere in North America and most of Europe. After every trip my friends and I came up with the same conclusion... there is no place better than Utah. Park City is in the middle of ten great Utah resorts. We have four kids and Deer Valley (which is in Park City) is incredibly family friendly. It wins 'Best Family Resort' most every year. If you want the best skiing in the world and a great place for your family.. it is a no brainer. I do not think that is overstated. Our business model has always been the same. Charge less and deliver more than the competition. People not only return, they refer others. The average condo in Deer Valley rents for three weeks per season. Our home has sold out the entire 16 week ski season for 13 plus years and still running! Despite the rental income, we have never taken a dollar of profit. We have put all money back into the unit to keep it remodeled and in excellent condition. Renters are always happy and always seem to treat our home respectfully. Judy, our manager, keeps in touch to make sure your stay is optimum. She is always ready with helpful suggestions and recommendations. We have never had an unhappy renter and we never want to. Best of all the central humidifier will keep you comfortable and your 'high altitude dryness' in check throughout this beautiful unit! Try to find that in other units! Bedrooms also have small portable humidifiers in case you are extra sensitive to the dry mountain air. Humidified air will make your vacation more comfortable. Have your kitchen/bar pre-stocked (minimal charge) per your desire. We can help make your stay extra memorable by divulging 'locals only secrets' about shopping, activities, ski areas, parking and the US Olympic Park. (We may be able to connect you to available run times on the Olympic Park bobsled with an Olympic driver!) Our goal is to make your stay so fun that you will rent this unit every year. (Ask the owner about return discounts). The house is in a perfect location and has a great floor plan for multiple families with kids. The owners and manager were wonderfully helpful and the well stocked house made our time at home convenient and comfortable. Excellent property!! Just a few steps from the bus stop!! Close to Main St and Deer Valley resort!! Spacious and cozy !! Great confortable beds! We would love to be there aguan! It was a bit tricky without a garage but we made it work. Lovely and spacious interior. Great location. Lock was a bit finicky but finally got it open. Very nice to come back to a comfortable home after long days out. Amazing place! Definitely looking forward to visit again soon! The Grady’s house is a great place. Everything was better than we expected and everybody had a great time. It is super close to the ski resorts and the owners are super helpful and always ready to help. Great place! Description is 100% accurate. 3 families, 7 kids (7-14). Plenty of room. Easy shuttle to DV. Walk to Main St. in 10 min. Everybody had a good time! We had such a wonderful time, I would not stay anywhere else. Love the sledding hill right outside the door, less than five minutes to the slopes, and perfect house for multiple families. We will be back. 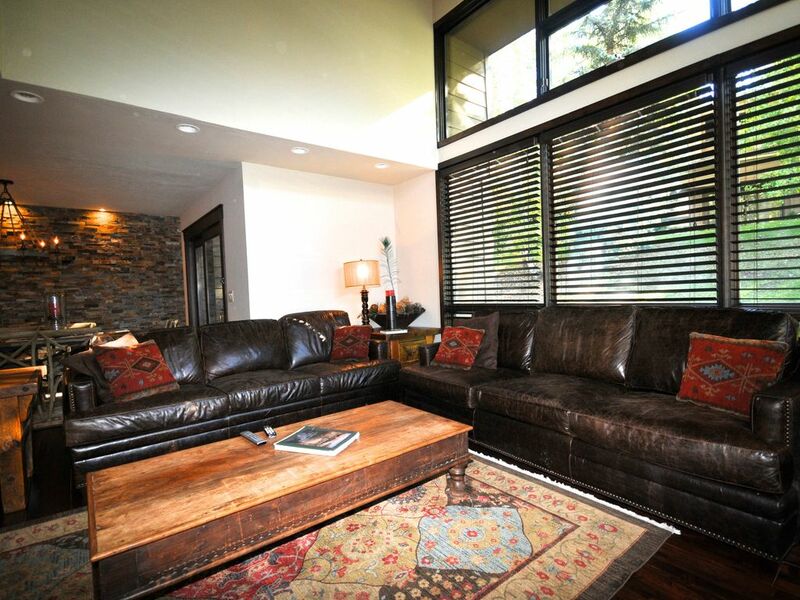 At 7,300 ft. altitude on Deer Valley Drive the condo is located exactly on the border of Park City and Deer Valley. The Shuttle literally stops at the front door every 10 minutes. Condo is only a one minute shuttle ride to Deer Valley's main lifts and 5 minutes to the Park City Mountain lifts. 12 minutes to The Canyons. 35 minutes to Alta, Snowbird, Brighton and Solitude. An hour to Sundance, Powder Mountain and Snow Basin. In the summer it is 10 minutes to water skiing and fly fishing on the Jordanelle and Provo River. 30 minutes to rock climbing. Mountain bike 300 miles of maintained trails via Deer Valley lift access (1 minute). Start your hiking experience out the back door. Owner has a comprehensive insider's list of adventures, their locations, info, phone numbers etc for you! Holidays: Christmas, New Years, President's Week ... $879-$1199/nt. Holidays: Martin Luther King. Additional charge for Sundance Film Festival Week & Thanksgiving. Return renter discount not valid on holidays.